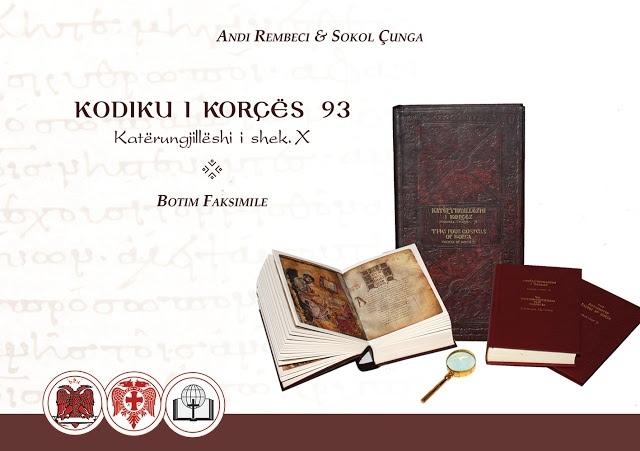 The Codex of Korça 93 is part of the collection of one hundred Byzantine and post-Byzantine manuscripts preserved today in the Central State Archives of Tirana, Albania. The Codex is from the 10th century and is written in the form of a cross, a fairly rare occurrence in the Byzantine manuscript tradition and is one of the oldest examples of this category on an international level. The publication of the Facsimile of this very important Codex was made possible by the contributions of the Inter-confessional Bible Society of Albania, the Orthodox Autocephalous Church of Albania, and the General Directorate of Archives of Albania. The Facsimile is accompanied by an exhaustive study of the Codex as a paleographic transcription of the Gospel of Luke with the corresponding translation in English. It is worthy to be note the fact that a Facsimile edition of this type is the first in the history of documentary publications in Albania, and has been prepared with the cooperation of local institutions. The field of publication of these kinds of historic resources is of limited circulation in Albania, whether due to the isolation of the past or to the lack of experience and opportunities. The publication of this Codex, as universally representative of the intellectual activity during one of the most thriving cultural periods of Byzantium, in addition to its scientific importance, serve as a contribution to the promotion of cultural heritage in Albania. Here is a news story covering the presentation of the facsimile edition to Sali Berisha, the Prime Minister of Albania and Jozefina Topalli, Chairwomen of the Parliamant, to whom it is handed over by the Archbishop Anastasios of Albania. You can also watch a 30 minute long reportage featuring one of the editors, Andi Rembeci, Lecturer in Palaeography and History at the University of Tirana who presents the fascimile alongside the original in great detail (in Albanian). At the end of the clip you can see Rembeci putting the Gospel codex back in its place in the archive. Thanks to Simon Crisp of the United Bible Society who drew my attention to this new publication. Crisp pointed out that my own article on Papyrus 72 was referred to in the accompanying volume of studies – I wonder what they wrote. As usual there is the infected issue of dating. The Kurzgefasste Liste indicates 13th century, whereas the Albanian scholars dates the codex to the 10th century. This codex and many other were photographed by the CSNTM in an expedition in 2007 when they rediscovered many MSS which had not been registered by the INTF – read about this expedition here. On the CSNTM webpage you also find a description and selected images of the Korça codex. Following up on Mike Holmes’ post on the changes between the 1st and 2nd editions of the Editio Critica Maior, this blogpost summarizes the presentation by Klaus Wachtel of the INTF, Münster, at the SBL in Chicago. – The text of NA28 has changed at 34 passages. A list of changes is available on the INTF website here. This list also displays the differences between ECM1 and ECM2, which are due to the benefit of using the whole database with the Catholic Letters. – Diamonds have been inserted in the text and the apparatus where ECM2 will display a split primary line. A list of these passages which are marked with diamond in the text and apparatus is available here. – The selection of witnesses has changed. – The symbol “Byz” is used instead of Gothic M.
– The aim of the ECM is to present all relevant material [I think for the textual transmission of the NT in the first 1000 years] and the initial text. – The simplest hypothesis (making least suppositions) is that the initial text represent of the text of the author as it is preserved in the extant textual tradition. However, a reconstruction of the authorial text is not possible in each case, every reconstruction cannot be absolutely claimed to be authorial. The present reconstruction is a hypothesis about the text of the authors. – The old text-type terminology is not useful any longer. Core witnesses of the Byzantine text are integrated into the network. The ECM Byz is represented by seven witnesses with a pure Byzantine text (these representatives changes from letter to letter). – Sometimes the editors preferred readings which were preserved in later witnesses (not the well-known witnesses). When the characteristic feature of the Byzantine text of smoothing out the text is not there, we can be sure that we have an old text before us. – 125 passages are marked with diamond – here it is unclear which reading is the initial text. The bold dot has been abandoned. NA27: Aim was more secure reconstruction of the original text. Question (at QA-session): At places where there is a diamond, why print a certain reading in the main text? Answer: It was done for practical reasons – the printed reading is the NA27 reading. It would have been a worse alternative to print a new reading. A little lesson on the use of brackets ( . ) in the apparatus of NA28. οτε δε εγενετο εξαρτισαι ημας τας ημερας, εξελθοντες κτλ. οτε δε εγενετο ημας εξαρτισαι τας ημερας, εξελθοντες κτλ. I was interested in the (33) - the brackets indicate a minor variation - where the text is given in an appendix of NA28 on page 829 (first printing): ημας ημερας εξαρτισαι. Stated in this way 33 is closer to the majority reading than the minority one. However, the full picture is slightly different. What we have is that the infinitive following εγενετο, εξαρτισαι, is replaced with εξελθειν, most likely under influence of the following participle εξελθοντες, and the article before ημερας is omitted. Then the correct infinitive is reinserted. 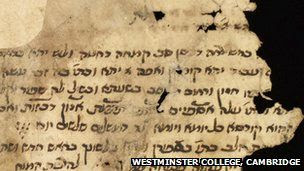 There is a fascinating two-days-conference in Oxford at the beginning of November, presenting the earliest known Ethiopic Gospels, the so-called Garima Gospels. It seems that the Ethiopican dark age (roughly the 7th-11th centuries) left the text of the Ethiopic New Testament largely unharmed. See here. Update: See Peter Head's blogpost about the Garima Gospels here. With some trepidation (and aware of some of the inaccuracies) I give you the promised link to the talk I gave for the Faraday Institute two weeks ago (this should lead you to the Cambridge University Media website). It was great to see Dan Batovici and Peter Head there (as well as many other friends). And yes, I use the term 'original text'. Most people understand this term better than some of the more recent proposals (intelligibility over technical precision). It is striking that 8 of the 13 differences between the two editions are not marked by either a diamond (♦)—which “indicates passages where the guiding line is split in the second edition of the ECM, because there are two variants which in the editors’ judgement could equally well be adopted in the reconstructed initial text” (NA28, “Introduction,” 55*)—or bold dot(s), which sometimes signal alternative readings of equal value to the text and sometimes simply mark passages calling for “special critical consideration” (ECM, 24*). Furthermore, of the 5 readings that are marked by bold dots or the diamond, none are marked by both dots and a diamond. That is, of the 107 marked variants, only 22 (20.5%) share the diamond and dot(s), while 85 (79.5%) have either one or the other, but not both. These numbers indicate that the means of signaling uncertainty in the text—dotted readings in ECM1, and “split guiding line” readings in ECM2 (= the diamond readings in NA28) overlap in only about 1 in 5 instances. Of the 88 “dotted” readings marked in ECM1, only 22 of them (25%) are marked in ECM2—a noticeable reduction. But at the same time, of the 41 diamond readings marked in ECM2, nearly half, 19 (= 46%), are new to that edition—a substantial proportion of the whole. Finally, one must keep in view the fact that of the 13 differences between ECM1 and ECM2, 8 (61%) are not marked (with a diamond or dots) in either edition of ECM. T. Callan, 'Reading the Earliest Copies of 2 Peter' Biblica 93.3 (2012), 427-450. Summary: An examination of the three earliest extant copies of 2 Peter (namely those found in Papyrus 72, Codex Sinaiticus and Codex Vaticanus) is made in order to determine how the meaning of 2 Peter is affected by differences among the three copies, especially the textual variations among them. These textual variations produce significantly different understandings of Jesus in the three copies of 2 Peter, as well as other less prominent differences in meaning. This is an interesting attempt to read the early manuscripts and detect tendencies within their peculiar readings, especially in relation to Christology. Although it is not very well-informed about text-critical matters, utilises a method I would regard as fundamentally flawed, and misses some significant data, it does raise some interesting questions. The article contains a number of errors and misleading statements. E.g. that Ehrman and Royse follow the same approach to variants and theological tendencies (p. 427 note 2), that the pages of P72 are half the size of those of Sinaiticus and Vaticanus, that Sinaiticus is lacking all of Genesis to 1 Chronicles, that Sinaiticus has 47 lines of text per column. He also adopts disputed positions without considering any alternatives, e.g. that the same scribe wrote Jude and 1&2 Peter in P72, that Sinaiticus and Vaticanus are from the same scriptorium. These are a little irritating, but don't impact the overall argument very much. As for method the intention seems to be to consider what '2 Peter would have meant to the readers of each one [manuscript]. My concern will be the meaning of the manuscripts as they stand.' (p. 428). But attention is only given to variants between the manuscripts readings and the text of UBS4. It is a bit like a severe form of redaction criticism which assumes the reader moved from one "significant" variant reading to the next "significant" variant reading, and doesn't treat the text as a whole. In addition he is rather inconsistent in deciding to treat the corrected text of Sinaiticus (except when a text is dotted for omission). On this basis the corrected text is not as early as he thinks, and since he is reading both original words dotted for omission and other corrections, he would seem to be reading a text that no one in antiquity actually ever read. As for missed data it is rather striking that no attention is given to matters such as punctuation, paragraphing, ennumerating, and such matters, even to the extent of missing the marginal notes or thematic summaries found at 2 Peter 2.1, 15; 3.3, 14 which would seem to have pretty clear implications for how the text could/would be read (see e.g. T. Nicklas and T. Wasserman, ‘Theologische Linien im Codex Bodmer Miscellani?’, New Testament Manuscripts: Their Texts and Their World (ed. T. J. Kraus and T. Nicklas; Leiden: Brill, 2006), 161-188, pp. 183f [have you got this online Tommy?]). He also doesn't make any thing very significant of the attachment of 2 Peter to 1 Peter in these three manuscripts (on which cf. the excellent treatment in R.W. Wall, “The Canonical Function of Second Peter,” Biblical Interpretation 9/1 (2001) 64-81). Having said all that by way of disappointment (especially with whatever editorial processes are happening at Biblica at the moment), there are some observations that are definitely worth thinking about. Here I would note: a) the possibility that P72's reading at 2 Peter 1.12 might be integrated into its general interest in divine Christology; b) the possibility that Sinaiticus exhibits the reverse tendency (2 Peter 1.1, 3, 14); and c) whether the proposed ethical distinctives (for P72 and Sinaiticus) are present or really significant. At the moment I am busy writing my seminar for tomorrow's event hosted by the Faraday Institute in my own College. I have had tremendous fun preparing so far. Here is the full blurp, I believe there will be a recording made available on the website of the Faraday Institute. The various texts that make up the current New Testament have a complicated transmission history. A history in which words and phrases were omitted, inserted or transposed, sentences were rewritten, and on a handful of occasions, whole sections were added. And because of the intense use of the Christian Scriptures, it is not a straightforward process to reconstruct the 'tree of life' of the manuscripts that carry the text. In this session we will describe current thinking and methodology, draw some parallels with biological disciplines that busy themselves with copying of information, and think about the perils of doing history. And of course, we will look at manuscripts. The Faraday Institute for Science and Religion Research Seminars are held at 1.00 p.m. on alternate Tuesdays in the Garden Room, Library Building, St. Edmund’s College. A free light buffet lunch and drinks are served from 12.30 p.m. onwards. All are welcome. The Garden Room is on the ground floor of the Library Building which is located in the far left-hand corner as you enter the College grounds. The free buffet lunch is served there. The inclusion of the orthographical variants into CNTTS' apparatus has made it possible for my capable colleague Steve Whatley to analyze orthographical tendencies of specific manuscripts within the textual tradition. He has analyzed about 3/4 of the New Testament chapters. His work will enable us to ascertain whether a manuscript truly supports a specific form of a word, or if it simply coincides with the orthographic variation. In addition to this line of research, Steve creates manuscript reproductions and led the develop of CNTTS' I-phone app. Steve says he welcomes questions and feedback on his research.